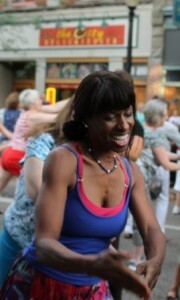 Spreading joy during a flash mob at Festival 2012. In addition to its open online journal, the Sacred Dance Guild has a blog – Sacred Dance Trends (www.sacreddancetrends.wordpress.com), an informal space where sacred dancers can document and discuss their personal explorations of movement and spirituality. If you are a sacred dance fanatic or a scavenging soul pursuing the underground, ancient practice of worshiping the divine through movement, this blog is for you!